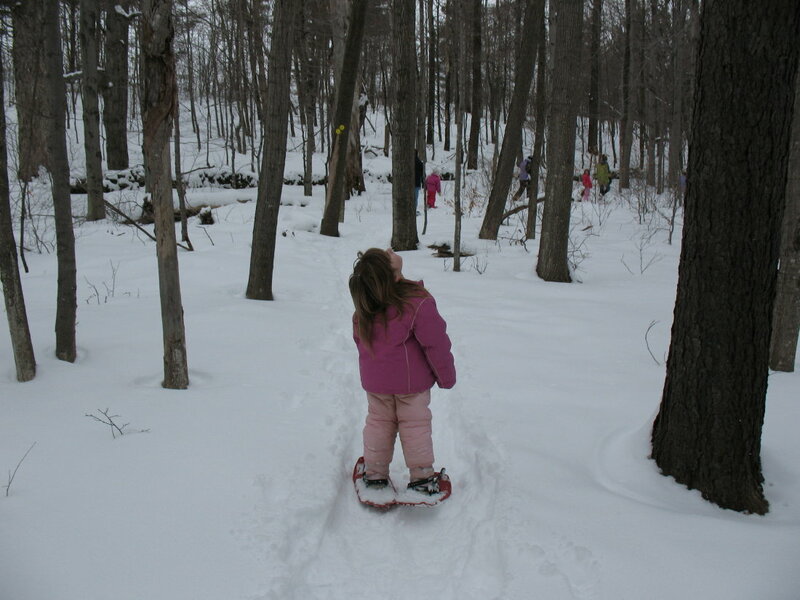 We went to Thacher Nature Center‘s annual Snow Day for the first time ever. It was absolutely worth the drive–they were all about packing in the fun. 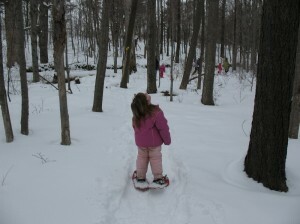 First, we went on a whopping 1-mile snow shoe hike in which the average kid age was probably 6. All of the grown-ups were discussing the value of peer pressure, because many of them would have conked out if it weren’t for the couple of older dynamos who kept them motivated. It was the first time on snowshoes for both of my girls. M had a lovely time, but J struggled a bit. Honestly, she could have kept up, but she was walking along noticing the splendors of nature while the rest of them were in it for speed. Two or three times I gave up and put her on my shoulders just because I didn’t want to hold the whole group back–we were that far behind. J observes the beauty of the trees while the gap widens between us and the rest of the group. So the kids were snow shoe maniacs, and they even all voted to take the longer route (the “full schoolhouse”, if you’re a regular), but it was getting to be a teensy bit of a death march for the youngest by the end. Luckily, at the end of the long march there were. . . .
S’mores at a campfire! Woo, hoo! The perfect antidote to whining. Because your can’t form whines around all that gooey marshmallow deliciousness. Thus recharged, we headed back into the nature center for a smorgasbord of craftiness, including plaster of paris animal track molds–an unbelievably easy craft with a satisfying end-product that will no doubt slowly crumble on their bureaus for years to come. They stamped some bookmarks, they cut some snowflakes, they lingered wistfully in the gift area even after I reminded them that we’d just purchased the experience. Which was priceless. There was actually a cute necklace I would’ve liked, too. Last up was the storyteller, and I felt a bit bad for her, because when she started we’d already been there for 2¼ hours, so everyone was running out of steam. After two stories she paused for a drink, and the place emptied as all the kids went running to retrieve their plaster animal feet. We stayed for one last story–alas, she lamented, she’d been building up to the best one. Sure enough, it was a story of a woman who acquired heroic superpowers through farting. I’m not kidding. M almost went into laughter convulsions. J, who was less familiar with the myriad terms for gas, enjoyed herself once I gave her a whispered vocabulary lesson. It was a good time that incidentally also wiped us out. J fell asleep on the ride home and M & I came home and immediately ate a snack. And then after the snack, I made myself a peanut butter & jelly sandwich. Perhaps you’re thinking that this whole outing was all about us, since it won’t come again until next year. But, see, next year I’ll tell you and I’ll remind you all that it was very fun. Also, two other items: we drove past some lively sledding at the Tawasentha Winter Recreation Area just off Rte. 146 in Guilderland–looked very fun, and I didn’t have it on my original list. Also, the snowflakes that we were cutting were specific patterns, 9 of which you can obtain from Dave here for free. Finally, you’ve probably heard–possibly from one of the many Facebook groups?–that Thacher’s in danger of closing. They’re asking people to make calls–because phone calls carry more weight and are quicker. In the past people have mocked me for “acting like the New York political system actually works”, but what else can you do? Give up entirely? Because apathy just lets people get away with not paying attention to you. I’m not saying that I think it will help, necessarily–I’m just saying that I feel morally obligated to try. Anyway, if you think Thacher should stay open, call the Governor Paterson at 474-8390 or your local legislators (use Find My Senator for Senate or Member Search for Assembly) or the New York State Parks Department and tell them. I know: a bunch of places are under threat. . . . so if it’s not Thacher that you love, pick one of your favorite parks or not-for-profits and make a call. I freakin’ hate the phone–believe me. I once cried because my mom asked me to order a pizza. But I’ll call if you will.